Allison Duran shows a shoe she made on a whim for "Hannah Montana's" Mitchel Musso. He signed it, kept one side and let her keep the other. 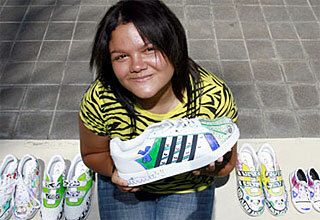 The 18-year-old entrepreneur has tapped into the MySpace crowd to market shoes she hand-colors with permanent markers.